They’re here. They are huge, gigantic. They have sharp teeth and want to eat the whole cake. They are the BIG COMPANIES. What are you going to do against them, you who have an SME? If that is the case, and you have a small/medium-sized company or work in one of them, you are probably the most capacitated to tell us the many problems and some advantages that being an SME supposes on a day to day basis. And you will know that, although things are never easy, being a SME also allows you to hide some aces up your sleeve. If, on the other hand, you are planning to start your own adventure in the business world, perhaps it can help you to know some advantages and disadvantages of SMEs. They’re closer to their customers. It is one of the most obvious advantages. Medium and especially small businesses will deal more directly with their customers, which will enable them to meet their needs more accurately and to offer a more individualized service, and even establish some bond with their users. Once you know the business, the client’s link with the SME will often be simpler than with a large company. Because of their size and simpler structure, they will have a greater capacity to adapt to changes. In addition, it will help them to be closer to their customers, which will allow them to know the variations in the market before anyone else. For example, they will have greater capability to reduce their supply in times when there is no usual demand. They are able to better detect and take advantage of small market niches. As long as your eyes are wide open, an SME will have a greater capability to detect and satisfy very specific needs of its customers than a large company may or may not detect, or will not have an interest in covering, by being a bit too small for it. In SMEs, decision-making will normally fall on a person or a small group. This will make them much more agile by making resolutions than large companies, where decisions often require complex decision-making mechanisms involving a lot of people and teams. Greater proximity to management and a more global vision of the business (in large companies each employee’s work is less comprehensive and more specialized) will make it easier to emotionally connect the worker with the company’s objectives. This will often increase your motivation, and therefore your productivity. Within a small or medium-sized company it is easier to form bonds and know the qualities of others. This can be used to increase performance and improve teamwork. In addition, in certain situations, such as problem solving, it will be much easier to share the tasks among the people who are more knowledgeable or better qualified to solve them. By being closer, it will be easier for the different members of the company to communicate with each other. This will enable new ideas to flow and problems to be solved as a team. Normally, SMEs do not have the financial power that large companies have. For this reason, they will usually need external financing, which will also be more limited and in worse conditions, without the ability to access financial instruments available to large corporations, such as listing on stock markets, capital increases, etc. It may be difficult to reach a large number of customers and earn their trust. The task of reaching its customers can be very hard for an SME. The financial power of large companies allows them to make themselves known through mass media by advertising, but for small and medium companies, reaching a significant number of customers can be a task that requires years of effort. In addition, being less well-known than its larger competitors, SMEs may find it more difficult to convey to their customers the security that a large company can offer them. SMEs will have enormous impediments to benefit from the economy of scale, which will cause costs to be higher in certain types of business, as well as creating difficulties to adjust the prices offered to users. Despite being more flexible in dealing with changes, the lack of financial capability can cause major problems for an SME if it is forced to endure long periods of crisis. For this reason, during economic depressions, small and medium-sized enterprises often face enormous difficulties to survive, which causes the closing of many of them. Low bargaining power with suppliers and customers. Being a large company, and therefore generating huge amounts of business, provides a position of power when negotiating with suppliers and customers . 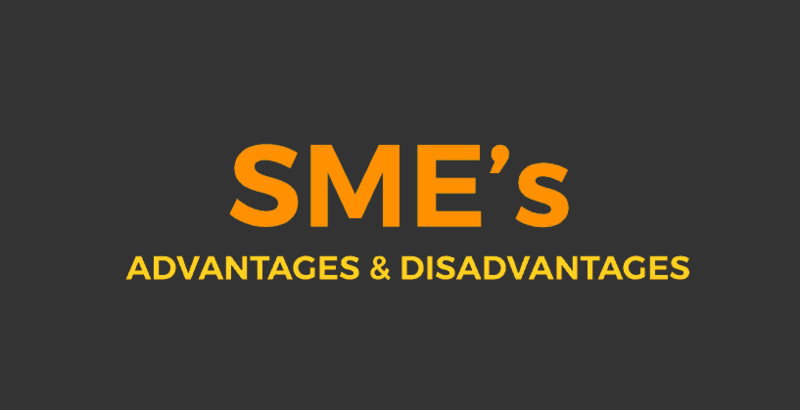 For an SME, it is much more difficult to achieve beneficial conditions and are often forced to give in more than they would like. Access to less skilled personnel. Given the greater limitations that an SME usually offers to develop a career (there will be fewer possibilities of advancement), it will be more difficult to attract talented and well-prepared workers who will usually be more tempted to develop their skills in a large enterprise. However, this does not mean that an SME can not attract talent, but will often have to offer other incentives. Unfortunately, and again for financial reasons, an SME will have more difficulties to adapt to technological changes, which could lead to obsolescence. However, there are very interesting technological solutions that SMEs can access. And now that we have already seen some of the advantages and disadvantages of being an SME, here comes a question: Do you know about Integria IMS? Integria IMS is a software that has many tools that can help your company to not fall behind. Discover all that Integria IMS can offer you. Thanks Adam for your feedback! Thanks Metlha for your feedback! Thank you so much for your insightful and informative knowledge.